Recipe originally published in Taste of Home, June/July 2010. I have a problem with cooking roast beef. I can never get it cooked and juicy enough for my taste. 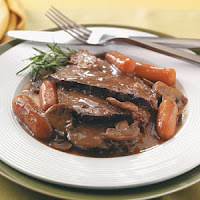 I decided to try a slow-cooker version with gravy. I will say one thing – I hate the thought of leaving my slow cooker on all day when I’m not around, so I tend to do slow cooking when I’m going to be home. My gravy doesn’t look as rich and dark as Taste of Home’s gravy. I’m guessing it is because I tried to lighten it up a little with no-fat gravy and reduced-fat soup. Still, it tasted great and was as thick as it needed to be. Recipe originally published in Every Day with Rachael Ray, April 2010. First, let me say that I’m not a chef. I may be able to cook and tweak a recipe, but I can’t create dishes. Not only do I not have the knowledge, but I just don’t have the time or money to play around with different types of ingredients. The reason I bring this up is about eight months ago, my husband told me he wanted to start eating more vegetarian food. This did not make me very happy, but not because I didn’t think it was a healthy move or I hate vegetables. No, I wasn’t happy because I rarely find a vegetarian dish that sounds appetizing to me and I don’t know how to substitute veggies in where meat should be. I searched around in my endless number of e-mails and magazines and found this delightful dish that uses mushrooms as a meat substitute. 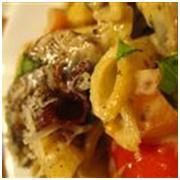 Now I am addicted to cooking with mushrooms and this is one of the very few recipes that I make on a regular basis. My goulash has a little more “sauciness” to it and I always seem to find jumbo pierogi. This is one of the most savory vegetarian dishes I’ve ever eaten. It tastes as good as it looks! Yes, I have made my own pierogi in the past, but although pierogi isn’t hard to make, it is ridiculously time consuming. 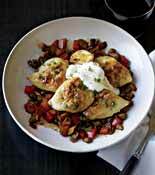 When I’m looking for a weeknight meal, homemade pierogi isn’t in the cards. Recipe originally published in Every Day with Rachael Ray, May 2010. I often get stuck in a rut. I’ll eat a ridiculous amount of shrimp and chicken in my quest to eat healthier, and then get really bored. The hard thing about most non-shrimp seafood recipes is that it doesn’t keep well and can quickly go bad before I get a chance to cook it. Additionally, I have to worry about the eco-friendliness of the different types of fish. Still, I took a chance on this eco-friendly cod recipe that had a significant sauce to keep it moist during the re-heating process. The thing that frightened me most about the picture from the magazine is that it wasn’t finished. It did look incredibly yummy, so I pushed ahead. My final dish doesn’t look nearly as pretty as the published picture. I have a couple overcooked areas on my fish & the sauce looks kind of squishy, but don’t let the picture fool you. It was delicious! 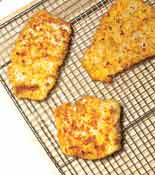 Recipe originally published in Good Housekeeping, February 2009. Every time I turn around, I’m being told to eat dark, leafy greens – specifically spinach. My problem is that I really don’t like spinach salads and I don’t care for frozen (and usually soggy) spinach. When I stumbled upon this recipe in Good Housekeeping, I decided to go for it – and I’m so glad I did! 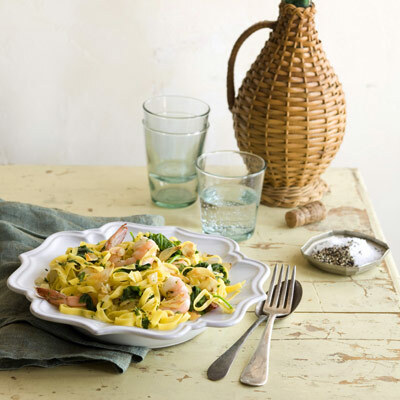 The baby spinach is perfect in this dish and while it is substantial enough to eat for dinner, it is equally perfect for a light lunch. I always get really excited when my dish looks almost exactly like a published picture. If I don’t say so myself, I think it looks even better. My spinach looks much more crisp and tasty and there’s a reason for that. Recipe originally published on Allrecipes.com – The Daily Dish newsletter on Monday, March 23, 2009. I love pasta and I’m always on the lookout for a new dish with a cream sauce that isn’t too heavy. This recipe found its way into my inbox via “The Daily Dish” newsletter at Allrecipes.com. This dish has everything I love – creamy sauce that doesn’t weigh down the pasta, salty pancetta to balance out the cream and mushrooms. I can’t get enough mushrooms. I always stand by my “don’t judge a recipe by the published picture” rule. Is that mushed-up poop with that penne? I get a lot of people asking me how I learned to cook and what my secrets are. I sat down and gave it a lot of thought one day. When it comes to cooking failures, I’ve seen my share. Man, have I seen my share. Now on occasion, it is something silly like dropping a ten-pound bag of flour all over my kitchen or catching an oven mitt on fire with my hand still in it (which was both recent and hysterical), but most of the time, it comes back to one of these five rules that I’ve violated. So I bestow my list of rules on to you. If you try to stick to these rules, it will make your cooking life much easier. You’re not going to be Julia Child or anything, but it will give you a good start.